The triumphs and tragedy of Beagle 2, the UK’s mission to search for life on Mars, must surely be familiar to anyone with even a passing interest in planetary astronomy or space science. The achievement of getting an underfunded lander from the drawing-board to the Red Planet is a remarkable one. While there remains a very positive legacy (I’d bet more people in the UK know about Beagle 2 than know about Mars Express), it was, and is, a bitter disappointment that the lander failed at the very last hurdle. No-one can feel the disappointment more keenly than Colin Pillinger, the man inextricably linked to Beagle 2. 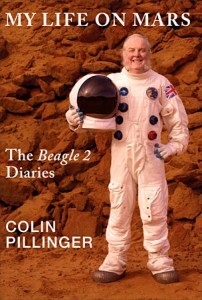 My Life on Mars, subtitled ‘The Beagle 2 Diaries’, is his personal record of the long road to that sad anticlimax. Part autobiography, part diary, it is the unashamedly subjective story of the people and politics that lie behind the lavish PR and the scientific goals of any space mission. And as much as, perhaps more than, a chronology of events, it is an insight into what can be achieved by a driven scientist. Colin is revealed as cheerfully self-deprecating, but at the same time he clearly isn’t a man handicapped by indecision or self-doubt; to judge from this account, he knows how to do PR better than the Saatchis, how to make TV programmes better than the BBC, and how to run space missions better than ESA. He takes pride in being a maverick at the vanguard of the Awkward Squad, and is frustrated when everyone is marching out of step except him. It’s easy to see how he might rub many people up the wrong way – and vice versa; the book is delightfully indiscreet, with no opportunity lost to name and shame those whom Colin sees as “the really bad guys”. The writing style is informal (the asterisk gets more of an outing in this book than any other scientific biography I’ve read), and the text doesn’t give the impression of having been vetted by a professional editor (revealed particularly in an irritating aversion to the semi-colon). I also missed an index very badly, as well as a more thorough – and alphabetical – list of acronyms (I marked one page, pretty much at random, which featured not only OU, BBC, BNSC, and ESA, but also AAF, FFP, GAP, ITT, MBA, and PP – help!). Nevertheless, the narrative moves along with such momentum that I found it almost impossible to put the book down. The elements that make the skeleton of the Beagle 2 story are well known – the constant struggle for funding, the involvement of the likes of Blur and Damien Hirst, the long silence of Christmas 2003. Life on Mars reveals the beating heart of that story. In 2005, I (and several million others) read The Da Vinci Code. It opened with a claim about the factual nature of the content – a claim that quickly revealed itself as, at best, questionable. It then developed a cast of characters who were very clearly drawn as either the unfailingly heroic good guys, or the machiavellian bad guys. How it would finish was pretty obvious from the start, and I don’t think anyone would claim that it was particularly well written; and yet the story was so gripping that many found it an irresistible page-turner. ‘Life on Mars’ has much in common, and I warmly recommend it as a **** good read.